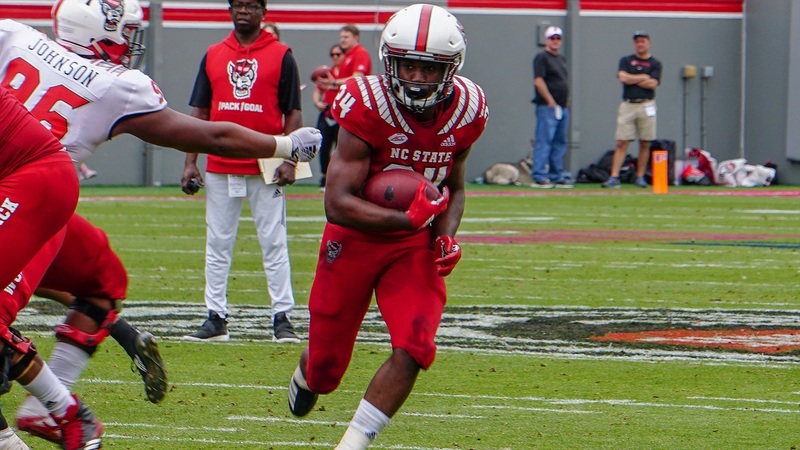 A four-star signee out of Bailey (NC) Southern Nash High School, Zonovan Knight‍ arrived at NC State in January with high expectations. However, that didn’t prevent him from still being a little nervous at the start of spring practice. “First practice I was a little nervous,” he said. “But that was my first impression, and I handled that pretty good. Overall I think I progressed every day in the spring. What helped his transition was the Pack’s need for him to be ready to go right away. With returning contributor Ricky Person out for spring practice, Knight was going to get every opportunity to receive a ton of work. He made the most of it and buzz quickly started to come out from various sources that Knight was flashing his big-play ability in practice. Late in the spring he battled through a nagging ankle injury, but it didn’t prevent him from suiting up in the Kay Yow Spring Game. Playing without virtually the entire projected starting offensive line, expectations were likely low for the running game, but Knight was able to be the star of the show. He finished with 17 rushes for 239 yards and a touchdown. He also added in three catches for 26 yards. The highlight was a 74-yard touchdown run where Knight found a crease inside the offensive line, broke the run to the sideline, and out-ran defenders to the endzone. Knight and Person should form a strong one-two punch in the backfield with Trent Pennix also factoring into the mix. While Knight isn’t sure yet how big of a role he’ll have, he thinks he did enough this spring to warrant a role in the rotation. As for the team, he’s going to enter 2019 with high expectations.